Wine chemistry inspires and challenges with its complexity, and while this is intriguing, it can also be a barrier to further understanding. 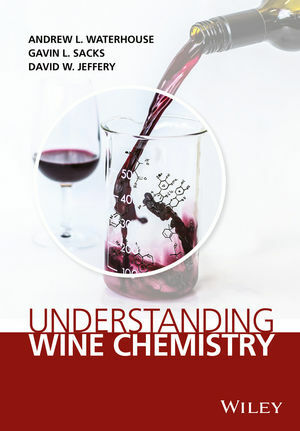 The topic is demystified in Understanding Wine Chemistry, which explains the important chemistry of wine at the level of university education, and provides an accessible reference text for scientists and scientifically trained winemakers alike. •Includes case studies showing how chemistry can be harnessed to enhance wine color, aroma, flavor, balance, stability and quality. This descriptive text provides an overview of wine components and explains the key chemical reactions they undergo, such as those controlling the transformation of grape components, those that arise during fermentation, and the evolution of wine flavor and color. The book aims to guide the reader, who perhaps only has a basic knowledge of chemistry, to rationally explain or predict the outcomes of chemical reactions that contribute to the diversity observed among wines. This will help students, winemakers and other interested individuals to anticipate the effects of wine treatments and processes, or interpret experimental results based on an understanding of the major chemical reactions that can occur in wine. Professor Andrew L. Waterhouse, Department of Viticulture & Enology, University of California, Davis, USA. Andrew Waterhouse received his PhD in organic chemistry from UC Berkeley, and has been a wine chemist at the University of California, Davis since 1991. He teaches wine analysis, graduate level wine chemistry, and an online introductory wine course, and is Chair of the Viticulture and Enology graduate studies program. Former graduate students and postdocs are academics, industry scientists and winemakers. His research lab has reported key wine oxidation reactions and has developed new methods to analyse wine components including those using LC-MS with isotope filtering, as well as NMR techniques. The research has focused on wine phenolics, oak compounds and oxidation products. In addition his lab has also been addressing the metabolic products of phenolics. He publishes in numerous international journals in the fields of chemistry and agriculture, and serves as a chief editor at the Journal of the Science of Food and Agriculture. See: waterhouse.ucdavis.edu.